Mail Out Ad Review : Another Obvious SCAM Or Legit Business? Bitcoins Wealth Club Review : Will They SCAM You? Bit4G Review : Legit Business Or SCAM System? Welcome to the Bit4G Review! I happened to come across Bit4G on social media, where I saw its affiliates pitching to others about the business opportunity. Out of curiosity I decided to investigate this company to try to find out what the fuss is all about. During my research, I discovered that Bit4G is a cryptocurrency company that utilizes artificial intelligence in mining bitcoins. The funny thing is that Bit4G doesn’t explain to members how the so called InteliTrade (an intelligent robot) works but still promises affiliates they will earn a good ROI. I have seen a good number of cryptocurrency companies promising people that they will earn a good return on investment only to collapse a few months later. I am not suggesting that Bit4G is like the rest, but before you invest your money in this business, you need to do your research. In this Bit4G review, I have gathered all the facts about this company, including the owners, compensation plan, and the products if any, so that you can make an informed decision. To find the owners of this company, my investigations led me to Bit4G website. However, I was disappointed to find that the website does not provide any information regarding the person who runs and operates Bit4G. In fact, there is very little information provided about the company’s background, which makes it hard to tell when Bit4G was started. With such crucial information missing, it makes this business look kinda fishy. However, I was able to find information about the company’s website registration. The website domain name for this company is ‘bit4g.com’ and was registered on October 11, 2017. Bit4G is stated as t­­­­­he domain name owner with an incomplete London address also given. The website has also provided a full corporate address that shows the company has offices in London. After further research, I discovered the London address provided on this site belongs to another company called Garden Studios. Whether Garden Studios is related with Bit4G, or the latter has offices in London remains unclear. Bit4G has no products which it sells to customers at a profit. If you join Bit4G as an affiliate, you will get the affiliate membership to promote to others. I don’t know about you, but this sounds like another Ponzi scheme to me. If you want to participate in Bit4G compensation plan, you must first sign up as an affiliate member and invest in the company. As a Bit4G affiliate, you will be required to exchange real money for B4G points. Apparently, you will be required to lend back the tokens you bought so that the AI bots can invest them for you. This is how Bit4G says affiliates earn high return on investment. · Affiliates make an investment of $100 to $1000 and earn per month ROI of up to 49 percent for 279 days. · Affiliates make an investment of $1010 to $5000 and earn per month ROI of up to 49 percent plus an additional 0.15 percent every month for 219 days. · Affiliates make an investment of $5001 to $10000 and earn per month ROI of up to 49 percent plus an additional 0.25 percent every month for 159 days. · Affiliates make an investment of $10010 to $100000 and earn per month ROI of up to 49 percent plus an additional 0.4 percent every month for 119 days. 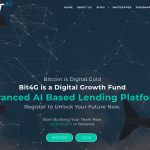 Bit4G uses an uni level payment structure to pay their affiliates a referral fee every time they recruit a new member. Affiliates in level 1 earn a referral commission of 0.008 percent which rises up to 0.1 percent in level 10. · Affiliates can earn high ROI from investing bots. · Detailed compensation plan that you can use to make investment decision. · There are no real products for affiliates to market. · Hard to tell if the company has a physical office or not. So, Bit4G wants you to invest real funds in exchange for tokens. The problem is that the points you get have no quantifiable value outside this business. Secondly, this company has no products or services which can earn profits. Therefore, the only way this company is making money is through the money affiliates are paying to join the business. That makes Bit4G a Ponzi scheme. When the hype about this company slows down, affiliates will stop signing up. That means Bit4G will be left short of money to pay their existing members. Like most Ponzi scheme, this company will eventually collapse leaving investors counting losses. My verdict is that you approach this company with caution to avoid losing your hard-earned money. I hope that you found my Bit4G Review and if you have any questions feel free to leave a comment below. 2 Responses to Bit4G Review : Legit Business Or SCAM System?